Many thanks to Emma (@pseudodeviant) for letting us repost this. This morning I got up very early and (with help from my wonderful partner & carer) got dressed, drugged and ready to catch a train to London. Collect a D-Lock and keys. Get into place at Oxford Circus (where Oxford Street & Regent Street cross). 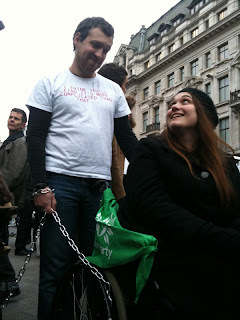 When the lights change UK Uncut activist would run across with a chain which would have each end attached to a lamppost. Wheelchairs were to roll over to the crossing and line up along the chain. Lock the wheelchair to the chain and start protesting! I wanted to protest against the both the Welfare Reform Bill and the cruel way it effects disabled people & children as well as the associated vilification of the disabled, poor and vulnerable. The government has decided to combat a fraud rate of 0.5% that they will take 20% off Disability Living Allowance by re-branding and reforming it into Personal Independence Payments (PIP). 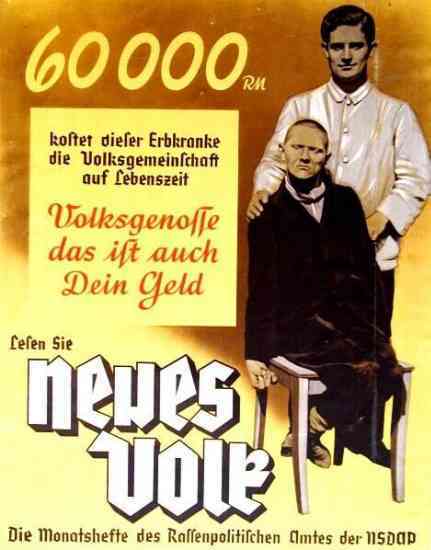 In doing so they are removing the assistance from DLA/PIP from 199 genuinely disabled people for every 1 ‘fraudster’* they catch. So they can remove so many they have made the criteria for PIP even more stringent than with DLA and they are including regular repeat assessments – regardless of whether your disability can ever improve or not. I wrote about how important my DLA is to me and the struggles I had obtaining it recently. The Responsible Reform Report (dubbed the Spartacus Report) details many areas of key concern better than I could here and it makes interesting reading if you fancy it. The Conservative led government has done what it always does when they want to cut benefits to the poor and the vulnerable. First they leak press stories vilifying the targets, then when public opinion is on their side they strike with cruel reforms & cuts. 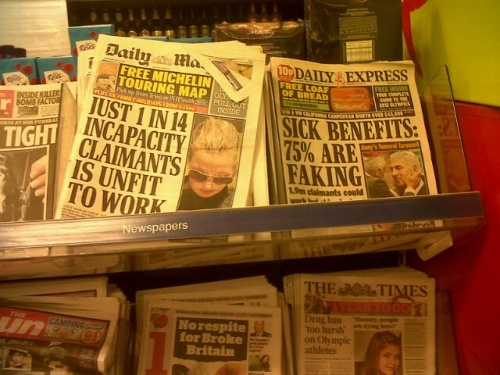 We’ve been watching over the last couple of years as more and more horrid and twisted headlines about fake disabled people, scroungers and those seeking an easy life on ‘lavish’ benefits have filled up our press. I’ve popped some examples of recent press headlines on the right. All of these are real and all of them have helped shape public opinion. We’ve seen disability hate crime soar up by 75% and most I’ve spoken to have noticed it. I blogged this December about my experiences at the local Christmas market and I’ve been stopped in the street by strangers who ask me “Do you really need that wheelchair or are you just pretending?”. It’s both annoying and painful but still, I’m lucky that I’ve not been on the end of some of the violent abuse that many others cite having experienced. 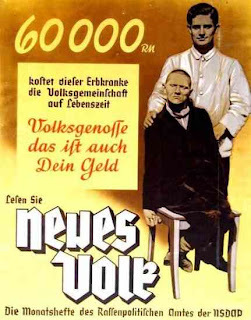 A German propaganda poster from 1938″60000 Riechmarks, this is what this person suffering from hereditary defects costs the Community of Germans during his lifetime. Fellow Citizen, that is your money, too.” It’s so similar to last years tabloid headlines it chills my blood looking at it. That’s why I joined the protest. That’s why I and many others chained ourselves in our wheelchairs across Oxford Circus. We see what is happening, how our rights are being eroded away and how thoughtless government propaganda is ruining our right to live free from fear and intimidation. We see all this and we are angry. We won’t go down without a fight. Even if it near kills us. The protest itself was brilliant. No sooner had we done up our D-locks and settled into a chorus of “No ifs, no buts, no disability cuts!” than the sound of sirens filled the air. The police & some people that I assume were fancy shop security (given the odd beefeater meets bellhop uniforms) surrounded us quite quickly but did nothing. The atmosphere was great, angry yet positive, vulnerable yet strong as steel. We had a wonderful time and met some fantastic people. I spoke to journalists, independent media and radio crews and watched as some amazing people got filmed by the BBC & Sky. We had initially thought we would get an hour at the most before the bolt-cutters cam out and we were either arrested or dispersed. I think that because of the amount of media attention we had the police were loathe to act and risk bad publicity. They also would have had a big job trying to arrest all of the wheelchair users as I don’t think their vans are particularly accessible. Still, by 12.45 the police were telling us that we could either move over and just block one side of the road (the street behind us was strewn with abandoned buses) or we could stay and they would take ‘appropriate action’. Many of those chained up expressed a wish to stay and risk arrest simply to show how serious they were about protesting the Welfare Reform Bill. Sadly we had to leave before the end as we had a train to catch but twitter informed me that everything broke up peacefully at around 2pm with no arrests or trouble. The wheelchair line getting into place. Me and my partner fashionably sporting chains and a Green Party flag. 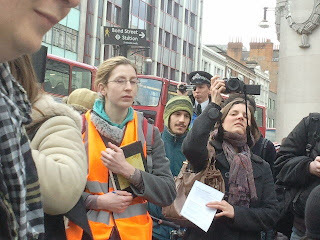 Legal Observers – the person in orange was from Green and Black Cross, the person at the back with a camcorder works for the Met. * let us remember that this term also includes disabled people that aren’t technically ‘disabled enough’ to receive DLA. Indymedia UK – Photos and Audio (which I think includes me) from the protest. 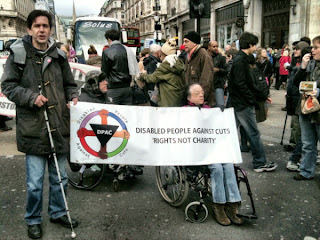 Ian Birrell in the Observer, Dec 2011 – The demonisation of the disabled is a chilling sign of the times. BBC News – Protesters show anger over the welfare reform bill and footage of DPAC’s Adam Lotun on BBC Breakfast. 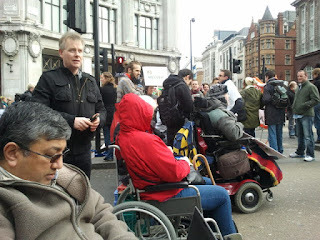 Daily Mail – Wheelchair users chain themselves together and block central London over welfare cuts. Mirror – Disabled bring Oxford Circus to a halt in welfare cuts demonstration. Coalition of Resistance – An ‘amazing’ success – disabled protest blocks Oxford Circus.